CIGS production modules were on display at the 26th EU PVSEC. I bumped into TSMC Solar Limited, a subsidiary of Taiwan Semiconductor Mfg. Co. Ltd. (NYSE:TSM), by accident when I took a wrong turn in Hall B5 at the 26th European Photovoltaic Solar Energy Conference and Exhibition (26th EU PVSEC). The CIGS or, to be more correct, CIGSSe (Copper Indium Gallium sulfide (di)selenide) photovoltaic (PV) modules on display caught my attention. From the TSMC Solar spokesperson, I learned the company is now ramping the first production line with a 100 MW (MegaWatt) nameplate capacity. TSMC Solar is “slightly ahead of schedule” and expects to continue the production ramp over the next year. The modules on display were produced on the TSMC Solar line. The TS CIGS Series High-Efficiency CIGS Solar Module German datasheet lists 130, 140, and 150 Watt-peak (Wp) maximum power ratings and 12.0%, 12.9%, and 13.8% module (not aperture) efficiencies respectively. TSMC Solar told me initial production is skewed towards 130 Wp with 12.0% efficiency. I forgot to ask about light soaking though the power tolerance is specified as -3% to +5% subject to “range tbc” which I assume means range to be classified. Product and manufacturing certifications are still pending. TSMC Solar emphasized their strategic partnership with CIGS technology developer, Stion Corporation, allows them to develop the technology on an independent path towards their 1 GWp (GigaWatt-peak) CIGS manufacturing capacity goal by 2015. 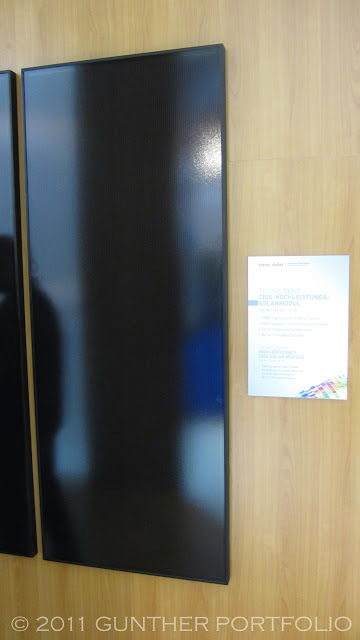 TSMC Solar also had TS Premium Series Polycrystalline High-Efficiency Solar Modules (German datasheet) at the stand. Rated at 230 Wp, 235 Wp, and 240 Wp, the silicon solar modules used Motech Industries Inc. (TPO:6244) branded cells and were produced in Germany by Centrosolar Group AG (ETR:C3O) via a manufacturing agreement. TSMC acquired a 20% stake in strategic partner Motech in December 2009. 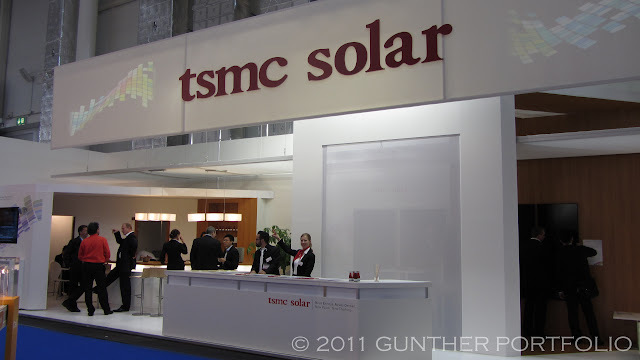 TSMC Solar does have a second source solar cell supplier, but, despite my best efforts, I could not pry the name loose from the spokesperson. In contrast to the 24th EU PVSEC in Hamburg, I did not hear any major PV module manufacturers say they were sold out in 2011. Only polysilicon producers made that claim. Expect to complete the product certifications by 1Q2012. TSMC Solar does not yet have sufficient data to comment on light soaking. TSMC Solar will deliver modules to pilot projects this year and plans to gradually ramp volume production. An English version of http://www.tsmc-solar.com/ website should be online by the end of September. A number of CIGS companies have announced pre-production champion efficiencies at 14-15%. Since this is pre-certification, that’s basically what the modules are. This is unimpressive for now. But it is TSMC, so give them time.